Member States at ITU's 20th Plenipotentiary Conference (PP-18) held in Dubai, United Arab Emirates, completed the election process that resulted in electing the organization's top five management posts, including the UN agency's Secretary General. The election took place in Dubai, United Arab Emirates, during the plenary session of the PP-18 conference this morning. Houlin Zhao of China was re-elected Secretary General with 176 votes, from 178 ballot papers deposited. He contested the position unopposed. Zhao, an information and communication technology (ICT) engineer who has served in a variety of senior management positions at ITU, will begin his second, and last, four-year term on 1 January 2019. "We continue to connect the unconnected," says Zhao. "We are strengthening partnerships to implement our common vision of a connected world, where information and communication technology is a source for good for everyone everywhere." Prior to first being elected as ITU Secretary General in 2014, Zhao served eight years as ITU Deputy Secretary-General. He also served two elected terms as Director of ITU's Telecommunication Standardization Bureau (TSB), which develops technical standards to ensure worldwide ICT interoperability. Before that, he was a Senior Counsellor with TSB for 12 years. "Since being elected Secretary-General of ITU in 2015, Houlin Zhao has attained marked achievements in overcoming the challenges that ITU faces in advancing its work and activities by way of promoting reform and innovation," said Wei Miao, Minister of Industry and Information Technology of the People's Republic of China in putting forward Zhao for re-election as ITU Secretary-General. "His pragmatism and spirit of teamwork has been widely recognized. We are confident that Mr Zhao will undoubtedly … continue to lead ITU in playing an even more important role in the worldwide development of information and communication technologies." 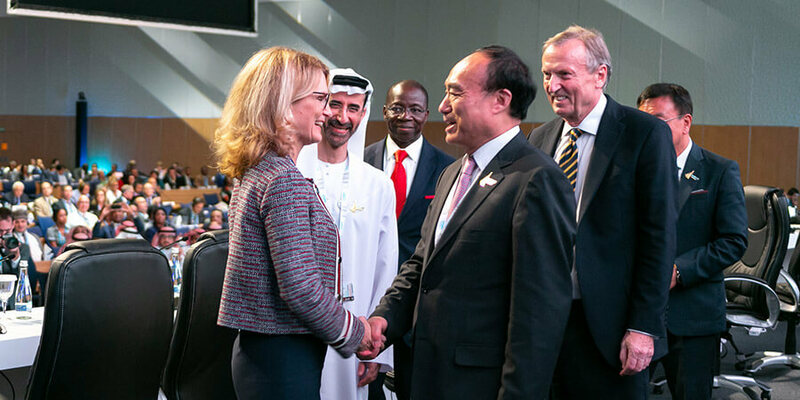 A major stride was taken to bridge the digital gender divide, with the election of the first woman to an ITU leadership position in the Union's 153-year history. Doreen Bogdan-Martin of the United States was elected to the post of BDT Director. Malcolm Johnson of the United Kingdom was re-elected to the post of ITU Deputy Secretary-General. Dr. Chaesub Lee of Republic of Korea was re-elected to the post of Director of ITU's Telecommunication Standardization Bureau (TSB). Mario Maniewicz of Uruguay was elected to the post of Director of ITU's Radiocommunication Bureau (BR).